Strawberry Picking in the Finger Lakes....in October! Imagine delicious strawberries ripe for the picking in October…..you will find them at Strawberry Fields hydroponic farm located on Route 20 between Skaneateles and Auburn. If you are not familiar with hydroponic farming, simply put it’s a process of growing plants in a medium other than soil and supplying them with all the necessary nutrients through the watering system, allowing for better quality control. This ‘dirtless’ growing method allows the plants to get exactly what they need to produce exceptional tasting fruit and there are no weeds! At Strawberry Fields the plants are grown vertically, stacked in pots one on top of another on a pole, five pots high. This means you do not have to bend down to pick the fruit. You can just walk through the rows of plants and snip the berries fully standing. Also, as everything is grown on a smooth black tarp, Strawberry Fields is handicapped accessible. This is u-pick at it’s easiest and the berries are some of the best I have every tasted! And because these berries never touch the ground, they are pretty much perfect and keep on growing until the first hard frost. 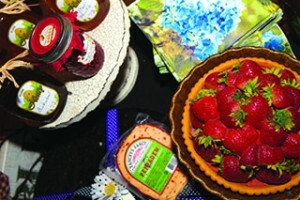 Strawberry Fields is more than a u-pick, it has a great shop that features their already picked fresh strawberries, plus also sorts of other locally grown and produced seasonal items including sweet corn, fresh tomatoes and herbs plus Yancy’s Fancy cheeses, flavored oils, New Hope Mills pancake mixes and delicious jams and jellies made with their homegrown strawberries, of course. Since adding their new and much larger gift shop you can also find other great gifts (I especially like their painted pumpkins in the style of MacKenzie-Childs courtly check!). It’s amazing the amount of unique merchandise you’ll find at Strawberry Fields, some strawberry-themed and some not. A sign in this quaint store reads, “Enter as Strangers, Leave as Friends” and that is the philosophy that the owners of Strawberry Fields live and work by. Stop in and see for yourself and experience strawberries like never before!